You’ve never seen such an amazing box like this before. Absolutely No Sound – This is the most quiet psychokinesis machine ever! This box can be used for unlimited effects! 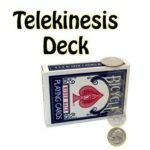 Telekinesis Deck is the most powerful item for your performance!